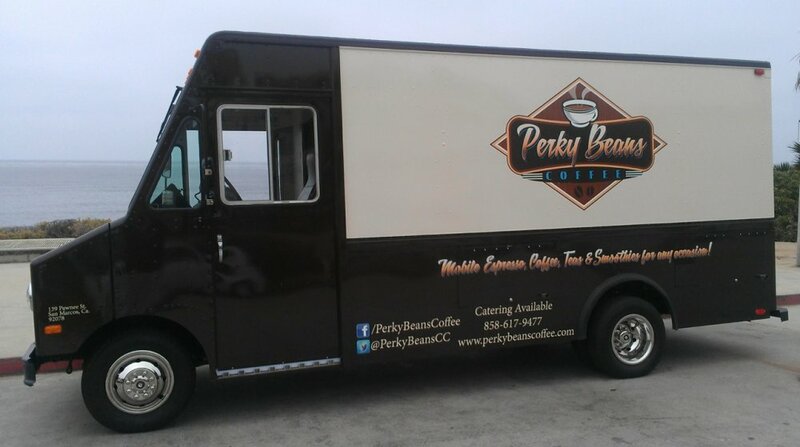 This Perky truck is available for parties or visit their coffee shop at 4750 Cass St. in Pacific Beach. Sometimes a fun sign is all you need to help you enjoy your cup of coffee. You have to love a coffee shop that calls itself “perky.” Perky Beans started as one of the first mobile cafés in San Diego, but they have expanded to cafés. The mobile café or “coffee truck” can be reserved for private or public events including weddings, holiday parties, corporate events, etc. They serve Cafe Calabria coffee and we tried and enjoyed the dark roast. They boast they are “San Diego’s Original Home of Frozen Hot Chocolate.” That’s on my “to do” list. Enjoy a cup of coffee, read a sign, and make it a perky day. This entry was posted in Coffee shops in San Diego, near the beach, Uncategorized and tagged Pacific Beach. Bookmark the permalink.